Having made the decision to be baptized into the Orthodox Church, we then set about the practical details. 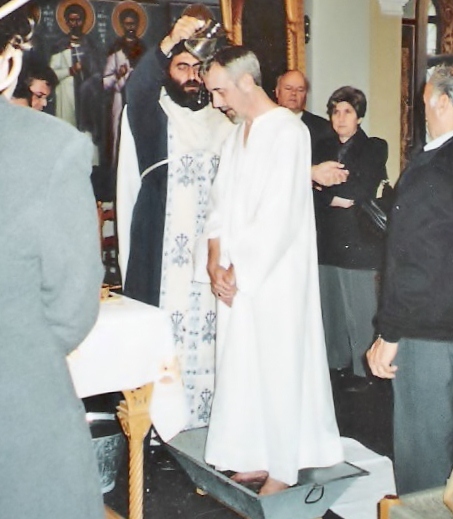 At that time, adult baptism was rare in this part of Greece and our priests and we had to improvise somewhat. The ‘font’ was no problem as there had been one other English couple baptized here some years earlier and they had bought a shallow metal bath to stand in. More difficult was overcoming the tradition whereby the godparent pays for everything including new clothes for the baby. We really didn’t want to put our respective godparents to unnecessary expense but we had quite a job convincing them that, as we were adults, they didn't need to buy us a complete new wardrobe each! In the end, we compromised by accepting with good grace our baptismal crosses as gifts and sharing the other costs. Further practical difficulties arose over the changing arrangements. Our priests decided that we could wear robes for the baptism so that they could pour the water over us, the nearest we could get to total immersion. We originally planned to change into and out of our robes in the church office but the day before the baptism one of the priests came up to us with the ominous words, “We have a little problem.” On that very day, the office was being demolished in preparation for rebuilding. As you may recall from the Athens Olympics, however, nothing ever fazes the Greeks for long and some quick lateral thinking from the priests resulted in a very unstable arrangement of old altar cloths hanging on strings in the corner of the church. Miraculously, they all stayed in place for the service and modesty was preserved. The service itself was an extremely moving and emotional experience but, since we had to concentrate on doing everything correctly, the full impact of the service didn’t really strike us until we watched the video quietly at home that night. For me, it brought back memories of my baptism in the Baptist Church when I was 13. Since the Baptists take the idea of total immersion literally and only baptize adults, every Baptist chapel has a small pool, in which the candidate is held by the minister as he goes completely under the water. It really does feel a bit like death and resurrection. While slightly less dramatic, the Orthodox service brought to mind another truth of the Christian faith. The old definition of a sacrament is “An outward and visible sign of an inward and spiritual grace” and rarely can this be demonstrated more clearly than when the priest poured the water over my head. I truly felt that the ‘washing away of sin’ was a reality rather than a metaphor. In fact, the emotion of the occasion was so powerful that, even after several years, when I pour water over my head when washing my hair, I am often transported back to that moment.